The objective of the Super-seed project is to explore how to assemble molecular building blocks into framework materials (metal-organic frameworks, MOFs; covalent organic frameworks, COFs) with precise structures, porosity, and thin-film morphologies. Frameworks are ideally suited for energy-efficient chemical separations but are typically isolated as insoluble crystals and powders that are not amenable to membrane fabrication. Furthermore, their synthesis is highly empirical and poorly understood. The Super-seed team will address this opportunity by carefully studying COF and MOF formation, so as to achieve unprecedented control of their composition and thin-film morphologies, and will use these framework thin films to forge a deep connection between the molecular design of membrane materials and their separation properties. The goal of this Seed is to develop new materials with unique properties through directed evolution. 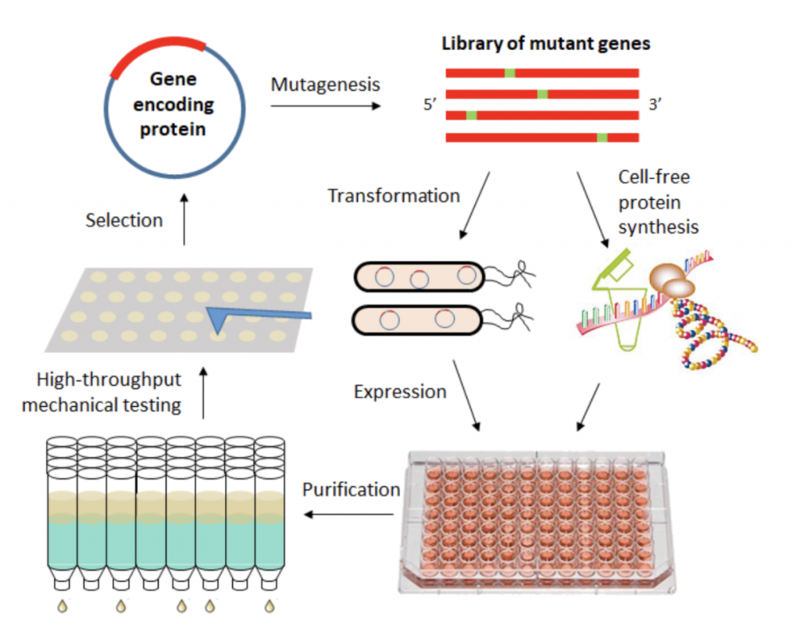 Through genetic mutation, protein expression, and high throughput materials screening, this Seed is harnessing the power of biological evolution for materials design. Our Seed is developing high throughput protein expression and purification techniques to synthesize sufficient quantities of material for characterization of mechanical and interfacial properties. Parallel efforts are exploring high-throughput screening methods to identify successful mutants within a large genetic library. Our work is developing new materials and understanding how existing biomaterials may have been developed through eons of evolution. Precise synthetic control of the local electronic structure of metal centers within materials offers the potential to engender exotic physical properties. In particular, tuning the electronic structure of metal centers enables the creation of strongly correlated electron systems, enabling researchers to ask fundamental questions about magnetism and superconductivity. Within this Seed, a team of researchers is working on harnessing classes of mixed anion systems to discover and manipulate magnetic and superconducting properties of materials. Currently, numerous materials offer the potential to host topologically interesting phenomena, thereby tying into the NSF goal of creating new quantum materials. Indeed, any material that offers fundamental excitations that differ from previously studied particles is of interest within this area. The Weyl fermions arise as the low-energy excitations in time reversal and inversion symmetry breaking materials due to the linear touching between two non-degenerate energy bands in momentum space. The band touching or Weyl points act as the source and sink of Berry curvature, and give rise to topologically protected surface states in the form of Fermi arcs, as well as exotic transport and optical properties. This Seed research proposed to provide a clear guideline to optimize the combined effects of quasiparticle density of states and Berry curvature for enhancing photovoltaic effect (PVE) and natural optical activity (NOA) of topological metals. Mixed-dimensional heterojunctions between 2D monolayers and 0D or 1D materials offer unique tunability and addressability compared to conventional semiconductor interfaces. While pioneering studies have focused on heterojunctions assembled by van der Waals interactions, organic ligands can modulate the stability and electronic structure of the individual materials. 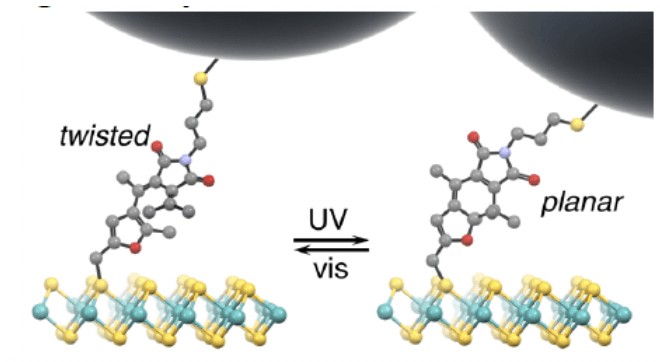 The goal of this Seeds aims to develop photoswitches, a class of light-responsive molecules that reversibly isomerize between two stable states upon irradiation with two different wavelengths of light, specifically designed for the environments of mixed-dimensional heterojunctions. The Materials Research Science and Engineering Center is supported by the National Science Foundation under NSF Award Number DMR-1720139. The Materials Research Center is supported by the National Science Foundation under NSF Award Number DMR-1720139.